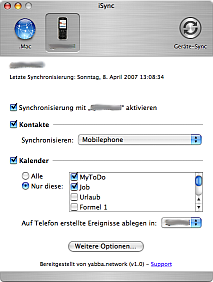 Mac OS X 10.4.x iSync 2.3/2.4 Plugin for the Nokia 6233. Activation of Bluetooth in "Address Book"
Dialing through Bluetooth and the "Address Book"
After the installation of my iSync Phone Plugin and the relauch of the iSync application you can start searching for a new device and you will be prompted for your Nokia 6233. Now you can select your new device, followed by activating the synchronisation and the selection which data you like to synchronize. Select you Address Book (Contacts) and/or your calendar (iCal) data. And now you are ready to start the synchronisation to copy your data between mobile phone and the Mac OS X. To activate Bluetooth press the button on the left upper part of the window of "Address Book" to get . Click on the left part of the number naming like "Work", "Private" or "Mobile Phone". 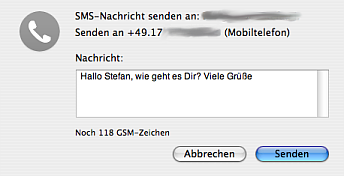 This opens a context menu with now two new activated parts "SMS-Message" and "Dial with XYZ". If you selected "Dial with XYZ" you now will immediately start a dialing connecting through your mobile phone. If the phone is in locked mode and standby it will also wake up and dial in this mode the selected number. With selecting the "SMS-Message" option you get an editor window in which you are able to write a short message (Standard SMS with max. 160 Character) to the selected mobile phone number. Download: iSync 2.3/2.4 Plugin for the Nokia 6233 (included with Mac OS X Installer). Universal, for PowerPC and Intel. The software is free and without any warranty. Use on your own risk. All used brands are owned by their owner and are only used to describe the process and context. All content and the offered software underlies the german and european copyright law. Any unathorized selling is prohibited. The software is free and without any warranty. Use on your own risk.